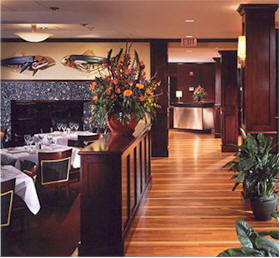 Large expansive venue with several dining rooms including some private dining settings. Despite the sprawling rooms, the atmosphere is warm and pleasant even if not seated near one of the fireplaces. The warmth comes from the dark woods, linen, and cloth booths. There is a nice comfortable balance of wood, glass, marble, and cloth - the rooms are bright and colorful due with nicely appointed floral accents. Table spacing is comfortable. Food - They succeed in their aim to do a few things well. Menu is simple but sufficient with a selection of fresh seafood selections complemented by adequate selection of appetizers and salads. Entrees are prepared with care and served with generous portions with accompaniments. Alaskan Frasier River King Salmon complemented by a tasty rich lobster sauce. Corn and pepper bisque was tasty. The crabcakes were uninspiring. Wine - Winelist is a WS Excellence Award winner - fundamentally sound and focused, predominantly American from California. Wines are expensive but due to the breadth and careful selection, it still offers something for every budget. They offer a BYOB policy with a $15 corkage fee (worthy of .5 rating point in of itself!*). They thoughtfully offer several selections including some quality offerings (Raymond Reserve Chard) by the glass as well as a nice selection of half bottles (Ramey Russian River Chard) including sparklers and some dessert wines. The list offers numerous premium wines but the prices are expensive. Service was personable and minimally adequate as the server was busy with numerous tables and had to walk a distance for drinks and entrees.